Examination of the outcrop at this locality suggests that dense growths of Calcipatera dominated this site and may have blanketed the substrate, creating a cryptic habit for a unique biotic association. Conclusions concerning this unique biotic association are based on the examination of (1) in situ specimens on the outcrop (figs. 2a and 6a), (2) large blocks of the bafflestone with in situ Calcipatera thalli and associated lithologies in the laboratory (fig. 6b), (3) numerous (over 100) hand specimens of individuals and clusters of Calcipatera thalli weathered from the outcrop (figs. 6c-6j), (4) oriented polished surfaces of the bafflestone with in situ thalli of Calcipatera (figs. 4, 5a, 5b), and (5) oriented thin sections (figs 5c-5f). 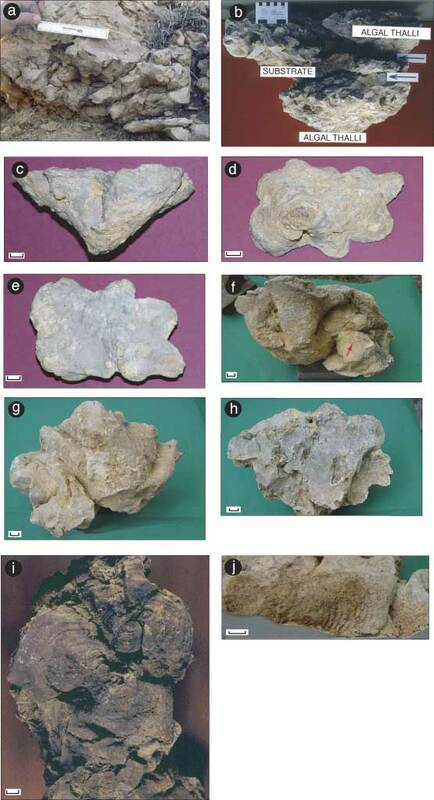 Figure 6--Examples of specimens used to reconstruct the Calcipatera community. (a) In situ outcrop block of Calcipatera in growth position; rule is 15 cm long. (b) Block of in situ Calcipatera bafflestone and associated lithologies reassembled in the laboratory. The block represents two in situ Calcipatera intervals separated by the substrate lithology (arrows). Top scale in cm. (c) Individual thallus of Calcipatera, side view; scale bar = 1 cm. (d) Base of specimen in c; scale bar = 1 cm. (e) Top of specimen in c; scale bar = 1 cm. (f) Cluster of Calcipatera thalli, side view; scale bar = 1 cm. Note encrusting foraminiferid Minammodytes? (arrow) on lower right of specimen. (g) Oblique view of base and side of specimen in f; scale bar = 1 cm. (h) Top of specimen in f; scale bar = 1 cm. (i) Base of a Calcipatera cluster; scale bar = 1 cm. (j) Wrinkled underside of Calcipatera thalli; scale bar = 1 cm. Specimens of the brachiopod Crurithyris, in presumed life position, occur on the exterior of some thalli (fig. 7a). Whole (articulated and disarticulated) and fragmented shells of Crurithyris also occur in the cup-filling sediment. Minammodytes?, an encrusting foraminifer, occurs attached to the exterior of some thalli (fig. 7b). Another encrusting foraminifer, Tuberitina, is attached to the interior (fig. 7c), and also contributes to the skeletal fraction of the cup-filling sediment. Crurithyris and the encrusting foraminferids occur near the upper edges of the algal thalli. A fenestrate bryozoan, attached to the exterior, is nearly encased by an algal thallus (fig. 7d). Shamovella is found within the substrate as well as attached to the thalli. Mobile benthic textulariine foraminifers (fig. 7e) and gastropods (fig. 7f) also are associated with the community. Additionally, fragments of pseudopunctate brachiopod shells, bivalve shells, ostracodes, trilobites, and echinoids were observed on polished surfaces and in thin sections. These taxa do not appear to have contributed significantly to the fabric of the bafflestone. These associated organisms were either epiphytic on the phylloid algae or capable of surviving in the cryptic niches beneath or within the Calcipatera clusters. Figure 7--Selected biotic components associated with the Calcipatera community. (a) Crurithyris (scale bar = 1 mm), (b) Minammodytes? (scale bar = 1 mm), (c) Tuberitina (scale bar = 0.1 mm), (d) Fenestrate bryozoan (scale bar = 3 mm), (e) Textulariine foraminifer (scale bar = 0.5 mm), (f) Gastropod (scale bar = 0.5 mm). The organisms in a - e appear to be attached to Calcipatera thalli. The living Calcipatera community created a canopy above the substrate and attached to these algal thalli were encrusting algae, foraminifers, bryozoans, and the pedunculate brachiopod Crurithyris. Mobile foraminifers, ostracodes, trilobites, bivalves, gastropods, pseudopunctate brachiopods, and echinoids occupied available surrounding spaces. Because most of the available living space was occupied by the abundance of Calcipatera, the biotic diversity of this community is low. It is likely that the organisms associated with this algal-dominated association were already adapted to the niches provided by the algal canopies. 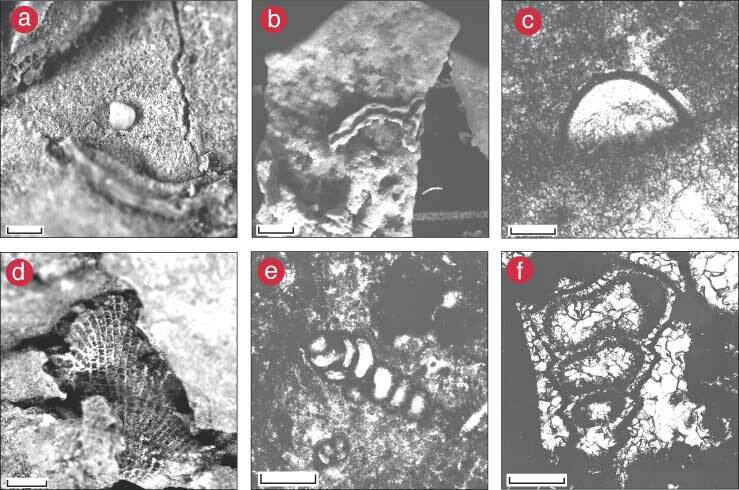 None of the preserved associated organisms is, to our knowledge, unique to this upper Paleozoic algal community. Thus, each of the associated organisms was probably adapted to a wide range of environmental conditions, only one set of which happened to occur in this algal-dominated community. Table 3 compares the Cottonwood limestone Calcipatera community to the Lower Permian Hueco Limestone phylloid algal occurrence, using the trophic categories of Toomey (1976). Of course, differences in data collection and analysis must be taken into account in the comparison of the two communities. Toomey (1976) dissolved 250 lbs of the silicified phylloid algal rocks in dilute formic acid and examined 50 large thin sections and was able to obtain a relative estimate of biovolume. The Calcipatera community, because of its in situ occurrence, preservation, and non-silicified character, was studied differently as described in the "Methods" section above. Table 3--Comparison of the Cottonwood limestone Calcipatera community to Toomey's (1976) Hueco Limestone phylloid algal occurrence. The Calcipatera community shares some general similarities with the phylloid algal community documented by Toomey (1976). The autotrophic phylloid algal genera are different, but the growth forms are quite similar. Agglutinated and calcareous foraminifers, bryozoans, and a single genus of pedunculate brachiopod are found in each community. Low to high filter-feeding organisms common to both communities are mobile foraminifers and possibly bivalves. Echinoids, ostracodes, and gastropods are classified as collectors and/or predators in each community. Organisms found in the Hueco Limestone phylloid algal community that are not observed in the Cottonwood limestone Calcipatera community include ammonites, fish remains, encrusting polychaete worms, and sponges. Trilobites, pseudopunctate brachiopods, and ramose bryozoans occur in the Calcipatera community but were not reported in the Hueco phylloid algal community described by Toomey (1976). Overall, in view of the different methods of data collection and analysis, the two communities seem to compare quite favorably. The occurrence of ammonites, sponges, and fish remains in the Hueco Limestone community could suggest communication with the open marine realm of the adjacent Orogrande basin. We would like to thank Marla Adkins-Heljeson and Liz Brosius of the Kansas Geological Survey who edited the manuscript, and Jennifer Sims and John Charlton, also with the Survey, who helped with the figures. The authors also would like to acknowledge the late Garner L. Wilde, who provided helpful discussions during the early stages of this study, and the continued encouragement of Evan Franseen. Excellent reviews by Gregory P. Wahlman and Karl Krainer were especially helpful in improving the final manuscript, and we are grateful for their time and expertise.